Well. I haven’t been doing a great job at posting 5 times a week in August have I? I have ALSO not been doing a great job at updating this blog with Lydia’s growth or milestones. WHOOPS. I’m going to remedy that now. I’m not sure I’ve ever posted her measurements here? After she was born anyway. If I did, TOO BAD you’re getting them again. Lydia started off very normal sized, at 7 lbs 1 oz, but she quickly decided gaining weight is not at the top of her priorities. Here are her measurements. Apparently she’s putting all her growing efforts into her head size. Mostly she’s a teensy little lady. She’s still wearing 0-3 month size clothes, although I suspect if I tried to put her in anything other than a onesie she’d need a bigger size for the length. At her 4 month appointment the doctor was worried about her weight, because she’d dropped so much percentile-wise and because although she was nursing on demand she wouldn’t take a bottle. He recommended maybe starting solids early, but within a week or so she was back to taking a daily bottle so we didn’t worry so much about the food thing. And, as you see, her percentile came back up (a smidge) by her 6 month appointment. (Which happened on Tuesday, by the way. The day she actually turned 6 months!) These days she nurses on demand and takes a 4 oz bottle before bed. Sometimes she also needs an afternoon bottle 2-4 oz, but not every day. She is 6 months now, so we can start solids anytime. And she’s seeming interested in our food, so I suppose I should. Blah. Feeding a baby is not my favorite. So messy! So time consuming! Sleep has been…not great. I think I blogged about that already. It’s been especially bad recently, with several nights where she was up for hours at a time, and multiple days where she got up for the day at 4 am. (Including today! Thankfully Brian took her at 5:30 and kept her until 7:30 so I could get a little more sleep.) I think there are many contributing factors here. For one, she picked up a cold from the older kids so she’s been snotty and snuffly for a few days. Also, she seems to be getting closer to crawling. She now scoots herself backward and tries to get up on her hands and knees. (It makes her SUPER mad, but she does it anyway.) I know developmental milestones can mess up sleep. AND she started rolling over WHILE she was swaddled so we’ve been transitioning from sleeping swaddled and in bed with me to not swaddled and in a crib. So. Lots of changes and not lots of sleep. Hopefully that will change soon! Other milestones, let’s see. She rolls everywhere. She’s a big fan of her play mat but gets pretty mad when the music is finished. She likes sitting in the bumbo, especially while we eat. We have to be careful though, because she’s reached that grabby-baby phase, so anything within reach is in danger. She likes the toys that go on her bouncer, which is a first for us. Kalena wasn’t a big fan of the bouncer, and Will loved being bounced, but never played with the toys. I’m not sure we ever put Daniel in a bouncer. She still naps in the bouncer too, mostly because I’m not willing to sacrifice that time yet and when I try to lay her in the crib for naps she only sleeps for like 15 minutes. I’m hoping that, like Will and Kalena, once she starts sleeping better at night naps will be better too. WE’LL SEE. Lydia is very much a binky baby. She LOVES her binky. This is another first for us. None of the other kids took a binky at all past a couple months old. She also has a lovey- a little teddy bear/blanket. (Way back when I was trying to get Will to sleep through the night our pediatrician recommended a “transition object” and that’s how we got him attached to Buster Bear. I’ve been doing the same thing with Lydia and this lovey.) Her reflux is getting better. She still spits up some, but it does not seem to cause her nearly as much pain as it was. 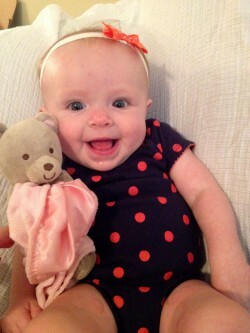 She’s generally a happy baby. See? It always cracks me up to compare other babies around Liam’s age with him…at 6 months he weighed as much as a lot of two-year-olds do (not even joking)! I love his chubbiness but sometimes I’m jealous of people with little babies…so much easier to carry! It’s funny how different kids are! My sister’s 1 year old & 3 year old are almost the same size. Crazy! Gah, solid-food feeding. Not my favorite either. Especially with A who gagged and barfed on virtually everything until 11 months. SIGH. Love that L has a lovey! I got Archer hooked on some old receiving blankets from B and he is such a blankie boy now. Even better, he’s not picky which of the four I give him. Six months was a dreadful time for us, sleep-wise. The good news is (maybe?) that in the following month we got much more solid napping and the longer wakings at night eased up. Hopefully you will see the same. I think she looks more like Kalena here, which is so cute. Little PEANUT. Oh my gosh she’s so darn adorable.